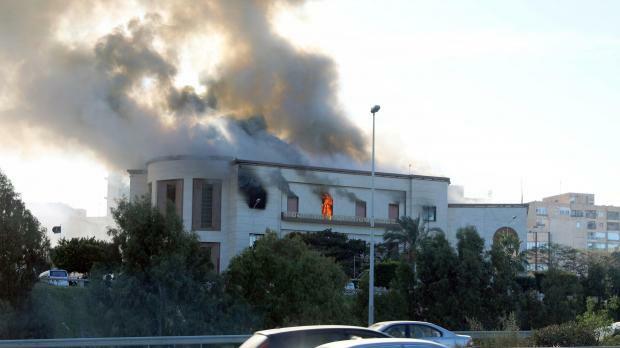 Three suicide bombers attacked Libya's foreign ministry in Tripoli on Tuesday, killing at least two other people as well as themselves, authorities said. "Security chaos in Libya offers propitious conditions for IS (Islamic State) and other terrorist groups," Bashagha said at a joint news conference in Tripoli with Foreign Minister Mohamed Taher Siala. He said the foreign ministry had been targeted because "it is a symbol of sovereignty". "All important documents have been saved," he said, adding that he deplored the death of one ministry employee in the attack. The foreign ministry earlier issued a statement saying: "The Libyan people are waging a war on terrorism on behalf of the world." The UN Support Mission in Libya (UNSMIL) condemned the attack, stressing the need to "prevent terrorist groups from turning Libya into a haven or an arena for their crimes". Siala said security arrangements agreed between Libya's Government of National Accord and the UN after a month of clashes in the south of Tripoli are yet to be implemented.